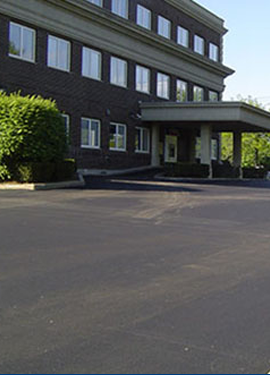 Asphalt Contractor in Brookhaven - DuMor Construction Inc.
One of the most important factors of any business is the parking lot, as it is the first impression that customers will get when approaching a business. For this reason the business owners in New York always contact the Brookhaven parking lot paving experts, DuMor Construction. 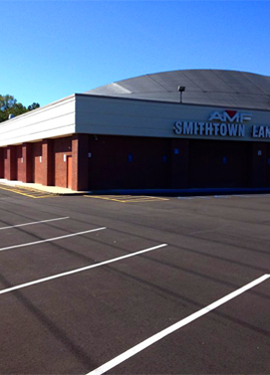 We have over three decades of experience with parking lot installations, repairs, and maintenance. We provide an array of services to meet the needs of our clients in Brookhaven. Whatever your parking lot needs are, we can guarantee that we can fulfill them. Our commercial paving services and unmatched customer service will leave no doubt in your mind that you chose the right company for the job. Brookhaven is approximately fifty miles from Manhattan and is the second most populous town in New York with a population of 486,040. The town was first founded in the seventeenth century and the first inhabitants of the area were Algonquians. English settlers starting arriving in the area in the mid 1600’s. The town’s name is an anglicized version of Setauket, an Algonquin name. The town has a rich history. The First Congregational Church of New Village was established in 1815 and has been restored and visitors can walk through the church to see the history and making of the church. A few other historic landmarks in the town are the Swan River School House, Gamecock Cottage, and the Josiah Woodhull House and Seldoon Farm. The oldest house in the town is the Brewster House, which was built in 1665. The home has been restored and preserved. Visitors can go on a tour of the house daily during tour operations. If you are visiting the town, then you should stop by these historic landmarks in the town. Main Street on the Harbor is the heartbeat of the town. Visitors can shop at a variety of boutiques and shops, purchase gifts at the Heritage Gift Ship or the Chocolate Works, then stop by The Village Coffee Market, Brew Cheese, or the Country House Restaurant to enjoy some of the best cuisine in the town. Visitors can also discover the wetlands on the Ward Melville Heritage Cruise. The boat cruise sits up to 27 passengers and the tour will take you through 88 acres of wetlands where you will see wildlife up close and personal. For all your parking lot paving needs contact DuMor Construction. All asphalt services is backed with a 100% customer satisfaction guarantee. We stand behind all our work. We provide no-obligation consultations. Give us a call today and schedule your consultation. 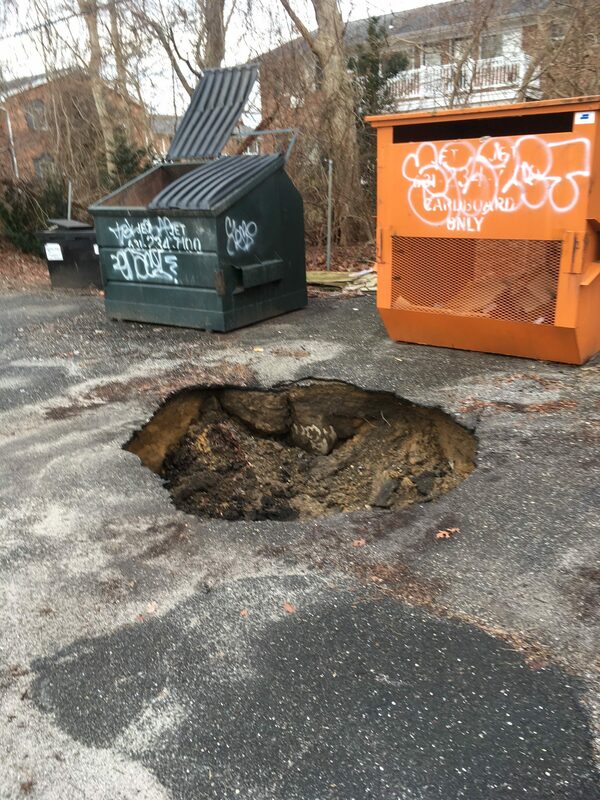 A client of over 25 years, experienced an early morning sinkhole emergency, and was in need of urgent asphalt repair. With a pile of RCA base blend stockpiled in our yard, our crew was ready to go, mobilized, and at the job site within the hour. 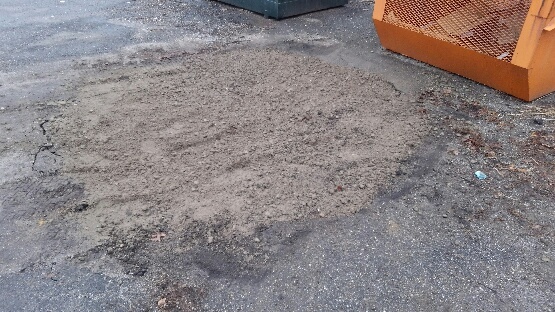 To complete the job, our crew installed 7 yards of RCA base in 6” lifts, and compacted each layer until the hole was completely filled. 2 hours after the initial contact, our client received a photo of the completed asphalt repair project. 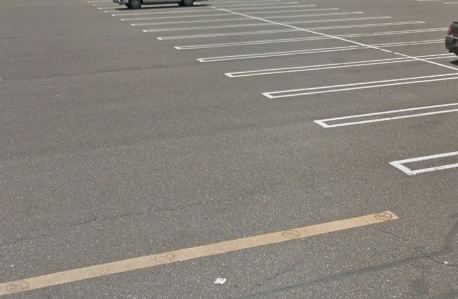 The parking lot repair was done efficiently and professionally, exceeding our clients expectations. 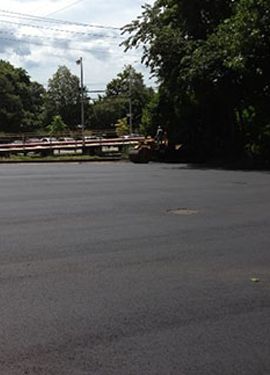 Satisfied customers and professional execution are a few things that make us Brookhaven’s top asphalt contractor. We got a call from a new customer that wanted a vacant space outside of their restaurant paved. We gave them an estimate for the new parking lot paving in Brookhaven, which they found to be very reasonable. Although it was a smaller space, the grading conditions were very favorable. The parking lot ended up looking amazing, and we were able to expand their handicapped parking by four spaces! The crew arrived and began prepping the land for the grading. The crew used our motor graders, so the land would be precise in having the water draining properly. The grading process is essential. If the grading isn’t done right, then the water will not drain properly and this could cause cracks, potholes, and major damage to the asphalt. Once the grading was completed the crew started getting the sub base laid. The sub base is what will provide the asphalt surface with stability. The sub base thickness was done, then the crew began compacting the sub base. The crew finished the sub base, then they began applying a layer of binder. The binder is a large mixture of aggregate that has oil added to it. This will make the parking lot strong, durable, and long lasting. After the binder is applied, the crew applied a layer of asphalt. The layer of asphalt would provide the parking lot with a smooth surface. The surface layer of asphalt is a smaller mixture of aggregate, oil, and sand. 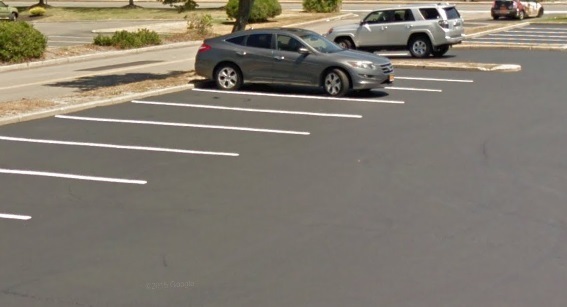 When the small aggregate mixture is combined the surface of the parking lot has that jet black appearance that is shiny. The crew then used the roller truck to compact and smooth the small aggregate mixture. 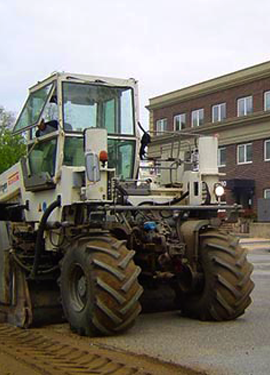 Using the roller truck would ensure that no stones are poking through the asphalt surface and it would provide a very smooth surface too. On the last day the crew arrived to the location to do the parking lot markings. The crew was able to add four extra handicapped parking spots that were clearly marked. Our crew knows the ADA standard requirements. Once all the parking lot markings were done our crew let them dry thoroughly for an hour. This would allow the markings to not peel off and to stay in place for a very long time. The crew had the new parking lot installation done and completed right on schedule. The new parking lot looked outstanding, which always makes our crew happy, because they know that we are the number one Brookhaven paving contractor to call for all asphalt needs. We go that extra mile to ensure that our services are done right the first time!